UIC sophomore point guard Tarkus Ferguson, who handed out a career-best 12 assists Wednesday night, is guarded by Green Bay’s Sandy Cohen III. What a difference Tarkus Ferguson makes. While the sophomore point guard missed nine games last month with a stress fracture in his right foot, UIC struggled to find itself, going 3-6 in that span. With Ferguson back in the lineup, running the offense and helping to spearhead the defense, the Flames won their second straight game Wednesday night. The Belleville, Ill., native tied his career-high with 12 assists as UIC was never challenged in an 84-73 win over Green Bay at the Pavilion. Ferguson didn’t score on 0-for-5 shooting, but he had plenty of help from teammates in that department. Dikembe Dixson scored 23 points on 10-for-12 shooting while Marcus Ottey continued his strong run with 16 points for the Flames (7-10, 2-2 Horizon League), who shot 58.2 percent in winning consecutive games for the first time this season. Godwin Boahen also scored 16 points, his most points since a game-high 17 against Kentucky on Nov. 26. With less pressure of having to run the team, plus improved health after dealing with a concussion a few weeks ago, Boahen shot 4-for-5 from the field with three 3-pointers. And that was theme of the night for the Flames as they overwhelmed the Phoenix (7-12, 2-4) like a tidal wave from the start. Boahen scored five points, including a 3-pointer, to help open a 15-2 lead with 12:29 left in the half. UIC kept stretching the lead after that. Dixson stole the ball and went coast-to-coast for a dunk and Ottey scored a layup off another steal as the Flames made Green Bay cry for mercy. Phoenix coach Linc Darner signaled for a timeout and the Flames were bouncing all over the court in celebration while heading for their bench with the score 25-6 with 8:45 left in the first half. UIC players Dikembe Dixson (left) and Clint Robinson celebrate after the Flames opened the game with a 25-6 lead. After Green Bay offered some resistance, Boahen knocked down a 3 from the top of key to close out a dominant first half with the Flames ahead 42-25 at the break. “We had the right mind-set,” said McClain, whose team carried the momentum it gained from the second half at IUPUI last week. “We knew that if we guarded, that would be our best offense. Our best offense in the first half was our defense. The Flames slammed the door with a 14-2 run in the second half, including a pair of 3s by Dixson and three layups by an aggressive Jordan Blount, for a 56-31 lead with 15:53 remaining. Blount matched a career-high with 13 points to go seven rebounds and some serious floor burn. His passion and intensity led to a testy situation with 8:53 left in the game. As he was trying to tie up Khalil Small on a rebound attempt, Blount was called for a foul on Small. Both players were aggressive in going after the ball and Small got in the face of some of the Flames. Darner was whistled for a technical as he stepped onto the court in attempt to protect his players and having the situation escalate. Just after that, the officials whistled a double technical on Blount and Small. UIC coasted to the finish with Green Bay making the score look respectable after a late 10-0 run. FLAMES FLICKERS: Tai Odiase collected eight points, six rebounds and four blocks for the Flames. He now has 301 career blocks, just eight behind the Horizon League mark of Youngstown State’s Damian Eargle. … UIC had 21 turnovers, but McClain said they weren’t “killer,” because of the Flames’ high shooting percentage and solid defense. The Flames did have a season-high 20 assists. … Small scored a game-high 27 points on 11-for-21 shooting for Green Bay while Sandy Cohen III, a transfer from Marquette, added 22 points. … The Phoenix shot just 34.4 percent in the first half in falling behind by 17 at the half. 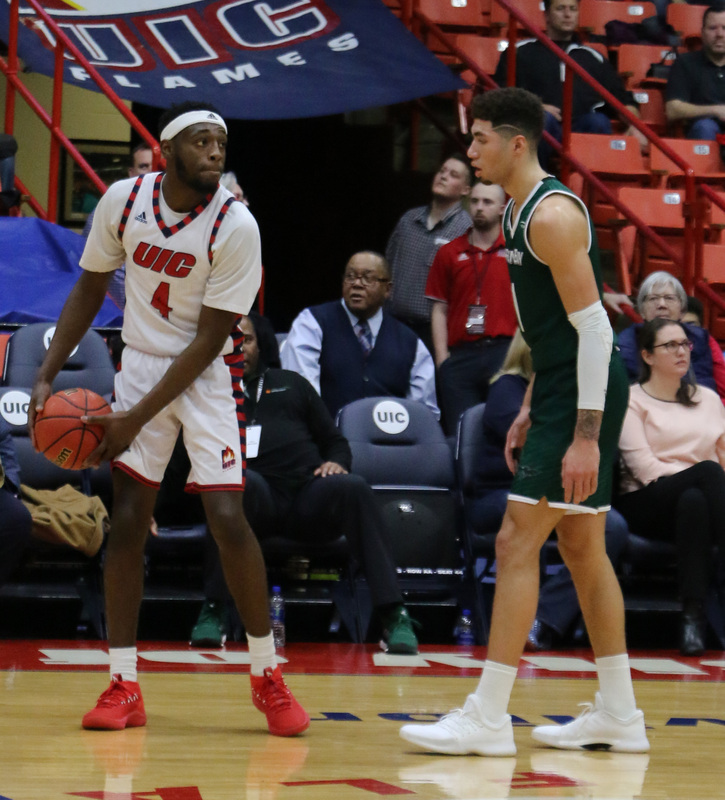 … UIC defeated Green Bay for the second straight time after snapping a 10-game losing streak in the series with a 79-70 in last March’s Horizon League tournament in Detroit.